Pollinators – especially bees – are an indispensable part of a healthy environment and a secure food supply. Nearly 85 percent of the world’s flowering plants depend on pollinators to reproduce. This includes more than two-thirds of the world’s crop species. The fruits, seeds, and livestock feed produced by pollinators provides over 30 percent of the food that we consume – an estimated annual value of $20 billion in the U.S. alone. Beyond agriculture, pollinators are keystone species in most terrestrial ecosystems. Pollination of wild plants results in fruits and seeds that comprise the diet of approximately 25 percent of all birds, and of mammals ranging from red-backed voles to grizzly bears. Despite their recognized importance, bees and other pollinators are in decline across the country putting the ecological service of pollination at risk. The European honey bee usually gets most of the credit for the pollination of agricultural crops. However, this introduced pollinator is experiencing many problems. The number of managed hives in the U.S. has declined 50 percent since 1950 and high winter losses continue to challenge beekeepers. Causes for these losses include introduced pests and diseases, poor nutrition from the loss of floral diversity, exposure to pesticides, and as of 2006-07, Colony Collapse Disorder (CCD). These worrisome trends have raised concerns about heavy reliance on European honey bees and the sustainability of pollination services. The threat to sustainable crop pollination is compounded by the fact that these declines are occurring as the demand for pollination is increasing. The area of cropland requiring bee pollination has doubled since 1960. We could experience significant pollination shortages unless we act to fix the problems. One possible answer is to turn to bees that growers have relied on for generations long before European honeybees made landfall in North America: native bees. Often overlooked is the tremendous diversity of wild bees in North America. There are approximately 4,000 species of native bees working as pollinators. Native bees come in all shapes and vary in size from large bumble bees with black-and-yellow fuzzy bodies, to small metallic green sweat bees, to even tinier little black bees. New research highlights the critical role of native bees in agricultural production. On a per-bee basis, native bees are far more effective pollinators than honey bees for many crops including apples, cherries, squash, watermelon, blueberries, pumpkins, sunflowers, and cranberries. For example, studies show that only 250 female orchard mason bees are necessary to pollinate an acre of apples. About one to two hives of honeybees would be necessary to do the same job – a total of 15,000 to 20,000 honeybees. Native bees also pollinate using “buzz pollination,” in which they grab onto a flower’s stamens and vigorously vibrate, releasing the pollen more effectively (a technique that is very effective for cross-pollination of blueberries, cranberries, tomatoes, and peppers). Honey bees, despite being valuable pollinators of many crops, do not buzz pollinate. In a global study of 41 crops, fruit set in all the crops significantly increased with flower visits by wild pollinators versus only 14 percent of crops visited by honey bees. Furthermore, wild pollinators improved fruit set at twice the rate of honey bees. Thus, pollination by managed honey bees supplemented, rather than substituted, pollination by wild insects. These studies and many more clearly show that the sustainability of natural areas, gardens, farms, and orchards relies on a diversity of pollinators. However, honey bees are not the only pollinator in trouble. Bumble bees and other native pollinators may be faring even worse. Status reviews by the Xerces Society, in collaboration with bumble bee researchers across the continent, determined that at least one-third of all native bumble bee species are at-risk. Other familiar flower-visitors are showing similar trends. Monarch butterflies are among North America’s most iconic species, but researchers and citizen scientists have documented a 90 percent decline in the North American monarch population over the past two decades. The primary threats to the monarch butterfly include the loss of milkweed – the key plant that monarch caterpillars need to survive. Luckily, pollinator conservation can be quite easy. Whether you are farmer, landscaper, community or home gardener, park or nature preserve manager, educator, or a concerned citizen there are simple steps you can take in reversing the trend of pollinator declines. Practices such as the restoration of natural or semi-natural areas, creating pollinator gardens, and protecting pollinators from pesticides are easy ways to make your landscape pollinator-friendly. To provide habitat for native bees, it is essential to understand how they live. With the exception of bumble bees, most native bees are solitary. The majority of native bees nest underground while the rest nest in narrow tunnels (often those created by wood-boring beetles) in trees or in the hollow, soft pith of certain plants stems. Unlike most native bees, bumble bees are social and the queens construct nests for their colonies in a variety of protected cavities including abandoned rodent holes, tree boles, and underneath brush piles or tufts of bunch grasses. Recognizing existing nest sites and protecting them from disturbance is critical as nests contain the next generation, and unlike honey bee hives, these nests cannot be moved out of harm’s way. Providing nesting habitat can be as easy as leaving field borders and garden edges untilled and unmown, creating brush piles, maintaining snags, stumps, and rotting logs (as long as they are not a safety concern). 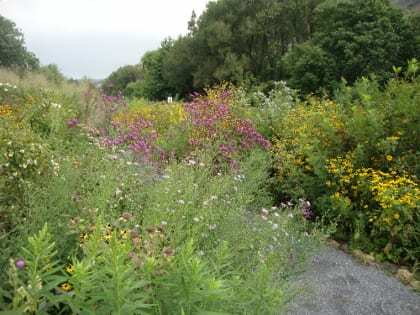 New habitat can be created by enhancing field borders, fencerows, riparian corridors, gardens, and other areas with plantings of native bunch grasses (e.g. little bluestem, purple lovegrass) or by establishing native plants with hollow stems (e.g. elderberry, blackberry, raspberry, sumac). To provision their nests, both native bees and honey bees depend on a diversity of flowering plants. Many crops provide floral resources, but they only bloom for a short period. Increasing the diversity of native, perennial wildflower to provide a succession of bloom will ensure adults have access to nectar and pollen from early in the spring until late fall. 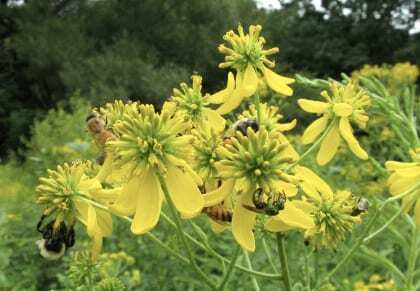 A diverse diet of wildflowers can also improve disease resistance in honey bees. Penstemon, milkweed, wild bergamot, dotted mint, New England aster, and goldenrod are some pollinator favorites. Search bee-friendly plant lists for your region. You do not have to plant expansive wildflower meadows to support pollinators. In small spaces, plant a few native pollinator plants in three feet diameter clumps. Clumping like-species makes small patches more visible and pollinators are able to move easily from flower to flower. 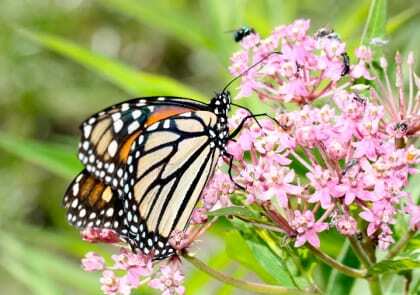 After you have your pollinator patches established, encourage your neighbors to do the same. These small plantings may seem insignificant to you, but if each yard devotes a small area to pollinators, your neighborhood will serve as a season-long buffet of nectar and pollen that supports a diversity of bees, butterflies, and other flower-visitors. If you do not have the yard space, you can fill a decorative planter with pollinator-friendly plants and place it in a sunny spot on your patio or stoop. Do not stop here. Organize a group effort to plant pollinator gardens in local parks, schools, churches, libraries, and other community spaces. Then use these gardens for educational demonstrations to educate others on the importance of pollinators and their habitat. Protect bees from pesticides. Many insecticides are broad-spectrum and have lethal effects (mortality) and sub-lethal effects on bees and other pollinators. Sub-lethal effects impair navigation back to nest sites, foraging abilities, reproduction, and larval developmental. Avoid using insecticides, especially on blooming plants. In addition, indiscriminate use of herbicides can reduce the abundance and diversity of flowers available as forage. Ask your community legislators, regulators, and municipal leaders to restrict the use of bee-toxic pesticides on city- and county-owned property, including schools, parks, and gardens. Sign the Pollinator Protection Pledge. Sign the pledge and take action to help protect pollinators and their essential habitats! Participate in Bumble Bee Watch. Do you already have a pollinator garden? Do you like to spend your free time walking through meadows or natural preserves? By participating in Bumble Bee Watch, you can contribute directly to the science of pollinator conservation. There is evidence that many species of bumble bees are in decline, but more information is needed to identify the most vulnerable before they decline to a level at which recovery is impossible. Since bumble bees are widely distributed, the best way to keep track of them is with an army of volunteers across the country armed with cameras. Participating is simple. Take pictures of the bumble bees you see in gardens, parks, or any other natural areas and submit the data to the Bumble Bee Watch database. Support the work of The Xerces Society, a nonprofit organization that protects wildlife through the conservation of invertebrates and their habitat. Established in 1971, the Society is at the forefront of invertebrate protection worldwide, harnessing the knowledge of scientists and the enthusiasm of citizens to implement conservation programs. Help protect pollinators and other important invertebrates by supporting the Xerces Society’s work, becoming a member, or sharing our resources. Visit The Xerces Society for more information. Kelly Gill is the Pollinator Conservation Specialist for the Xerces Society for Invertebrate Conservation and a Partner Biologist with the USDA Natural Resources Conservation Service (NRCS) in the Mid-Atlantic and Northeast Regions. She provides technical support to NRCS staff, farmers, and landowners for implementing Farm Bill practices to conserve pollinators and other beneficial insects. This technical support includes planning, installing, and managing pollinator habitat on farms and in natural areas. Kelly holds an MS in Entomology at Iowa State University. She may be reached at kelly@xerces.org. Landscape for Life: Put your Garden to Work!